Despite a late arrival into Tegel airport, only 8 kilometres from the city of Berlin, the welcome at the Hotel Adlon could not have been warmer, or grander. Stepping in to the warmth of the lobby lounge all senses are immediately coddled: the resident pianist presenting an interpretation of modern classics, the crisp taste and fizz of the complimentary prosecco served to us whilst checking in and the overwhelming aroma of wealth and classic opulence. This is no small feat, given that the hotel that had shared not only the name but also the footprint was blazed to the ground in 1949 by some overzealous Russians whilst plundering the vast and priceless wine cellar. The current hotel only opened in 1998, but alongside its established predecessors on one of Germany’s most famous boulevards – Unter den Linden – and in Pariser Platz alongside the fortified US Embassy and Frank Gehry’s DZ Bank, it can hold its own as a destination for tourists as well as the world’s most demanding of travellers. Having efficiently checked in, glass in hand we were escorted to our suite. Yes, suite. Now, I appreciate that this might sound over the top given that we would only be in residence for two nights, but I can think of no better way to experience all that this hotel offers than from one of its most impressive quarters. After all, it is the luxury, privacy and exemplary service that are some of the key reasons the hotel hosts visiting diplomats, royalty, international celebrities and oligarchs every week of the year. It is reassuring to know that the windows are all bulletproof and the walls and doors are steel lined as you plan your sightseeing, shopping or practice your red carpet swagger. I don’t want to say too much about the room (or should I say rooms?). I counted seven in total, but there may have been more I failed to find. One the one side there were the reception rooms – study, lounge and guest bathroom – and on the other the private quarters – bedroom complete with 4-poster, bathroom, shower room, toilet and a walk in wardrobe sufficiently proportioned to fit in the spring/summer and autumn/winter collection for a family of four. However extravagant the amenities in the suite may have been, it was the view of the floodlit Brandenburg Gate and Norman Foster’s Reichstag dome from the (two) balconies that broadened my smile the most. Well, that and the TV that automatically raised from the bottom of the bed. This is truly fit for a QC! Breakfast is taken in the winter garden restaurant and is presented ‘buffet’ style. Don’t be fooled though, this is not your typical ‘all you can eat’ offering. The world’s appetites are all catered for: a basic omelette made to order before you, noodle soup and dimsum, a choice of 24 jams and spreads (yes, I counted), fish, meats, pastries, breads, cakes and free flowing champagne, you could easily cover your ‘5 a day’ on one plate and feast on the Berliners for the remainder of the meal. The Adlon offers absolute luxury. You need not leave its confines and if you do, may experience – as I did – some guilt, cheating on it whilst taking in Berlin’s numerous other sights. The Tiergarten, galleries, museums and shops of Mitte, the impressive Reichstag and moving holocaust memorial are only a few footsteps away. However, if you can drag yourself away, the hotel’s concierge service is the best available, even securing us reservations in the much sought after and highly recommended Tausend Cantina. It might take some time to save enough pfennigs to return, but I feel that I have experienced the best that Berlin has to offer. Adlon might not be budget, but I have little doubt it’s the best. 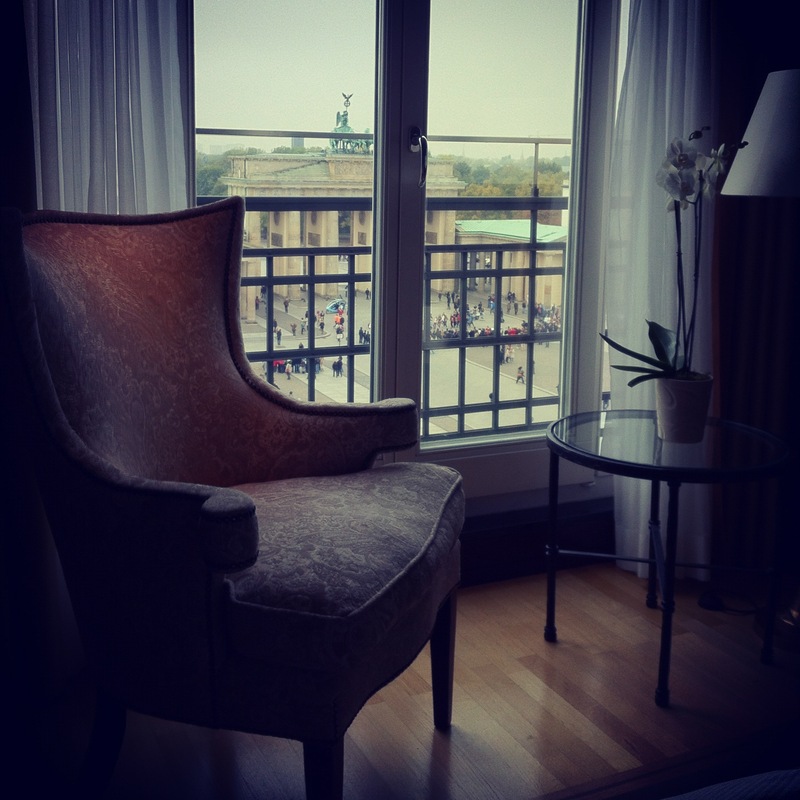 Tags: Adlon, Berlin, Germany, Hotel, Review. Bookmark the permalink.